When the world is grey and dark, don't be afraid to be that bold splash of colour. In other words, let your light shine! Hopefully I am doing that today in this fab tie-dye number from Sn@tch! I am standing out from the grey and being like the lighthouse behind me. Okay, technically these cars weren't going anywhere, but I needed a title for the post so there we are. I am loving this sim and had fun exploring it today. Very cool although I am a bit worried some of those buildings are a bit precarious. Thankfully there are no earthquakes in SL. It is time to get physical. That means that I will be saying things like, "No pain, no gain!" and "The stronger you are, the better you feel!" and "The only bad workout is the one you didn't do!" And, of course, I will yell them at myself in my loudest voice to try and mask how hard my heart is beating or how raspy my breathing is. This is kind of what I am going through in RL, although if I looked like my avi I probably wouldn't mind. Oh well, as they say, "I don't always love the workout, but I love the result." I found this cool sim today called Hope. Perhaps it is not new to you, but to me it is and it is awesome. I think what I love about these sims is that they show that when humans are no longer around nature just reclaims everything and slowly wipes out all trace that anyone was there. I feel like it is justice for the damage we are doing to this planet. We are not good stewards. I am trying to leave the place as I found it, so I will just wander about and enjoy the peace. Tucked in the corner of the garden is this perfect little spot. I think I would hang out here, but I would need to drag a chair from somewhere so I could laze in the sun while I think about gardening, but not actually do it. My favourite kind of gardening! This set is from Serenity Style. It is a gacha set called Gardener Corner and comes with all you see here except the daisies and bushes. 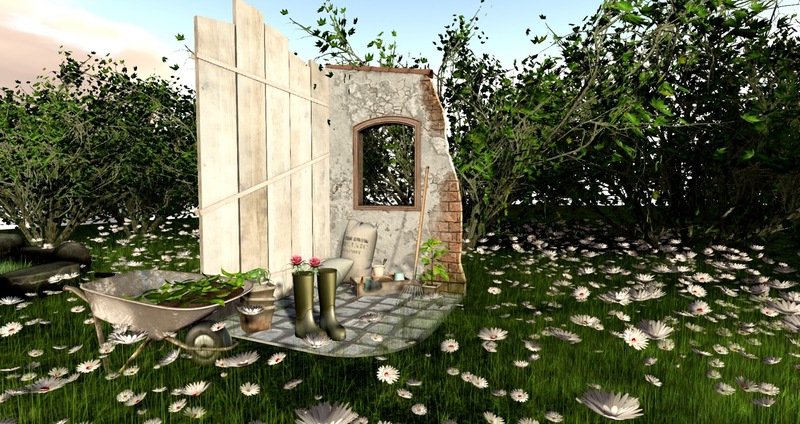 It was featured at Bloom but you will now find it at the Serenity Style mainstore. This was a set I was supposed to blog a week or so ago, but then I got sick. Sigh. The background shrubs are from Little Branch and are the Japanese Maple Shrub. They are animated and texture change as well as looking fab! Go grab them for your garden at The Men's Dept. The spring days are lovely but the evenings and nights are still a bit chilly. Definitely need a fire to stay warm. It is all well and good pretending that summer is coming, which it is, but the goosebumps on your skin keep reminding you that winter was just here. 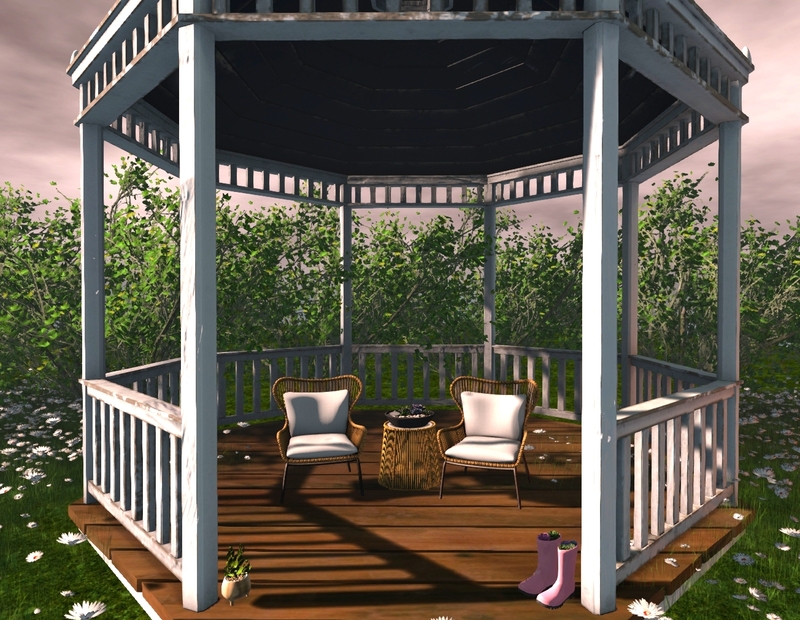 This gorgeous build is the Anerada Garden Kiosk from GOOSE and it is their new release for this round of Cosmopolitan which runs from the 8th to the 20th of April. The furniture set inside is from CHEZ MOI and is the Wicker Patio Chat Set. The set comes with the chairs, the table and the succulent pot. The chairs come with loads of great poses as all CHEZ MOI items do, and even has some great couples poses too. The seat cushions are texture change and there is a hud to make it even easier! It is also for Cosmopolitan so you can pick this up at the same time as the kiosk! Easy. The pink Succulent Rainboots are from Junk Food but there are a range of colours if pink isn't your thing. Go take a look at the mainstore. They are super cute! This seat and fire set are from CIRCA. The Brookside Sitting Sets include the Adirondack chairs in a range of wood textures, and the stone fire table which also comes with different marble tops to suit the look you are going for. They are at a very special price for Syndicate Sunday which runs from Apr 7th - 14th, so get going to snap up these goodies! I am still getting my head around this new SL Viewer so please excuse the lighting. I am having to learn new things and it is all a bit much when I am a bit tired. I will get there. I am determined. I know some of you will be thinking, "Why don't you try Firestorm?" Well, I have and I don't like it and neither does my laptop. That is all there is to say about that. I am a curvy girl in SL and in RL and I am okay with that. Sometimes it is nice to accentuate the curves in some smexy clothing and that's what I am doing today. In the words of the great Sir Mix-A-Lot "I like big butts and I can not lie..."
On a separate note, thank you all for your patience over the past week or so while I have been sick and while I have adjusted to the new viewer. I am slowly winning on both fronts. I am not sure William was right on this subject. I believe names have power and today this chick is looking very powerful. Don't look her in the eyes. Even though these poses from Nantra are called A Girl Has No Name, I do have a name. My name is Arya and I am brave of heart. My name means 'noble character' and 'wise'. It can also mean 'lioness' which means I am protective of those dearest to me as well as strong and loyal. You mess with the people I love and you mess with me. It rained in Aryaland today and where I live that meant a gorgeous coating of snow on the mountains. It looked amazing. 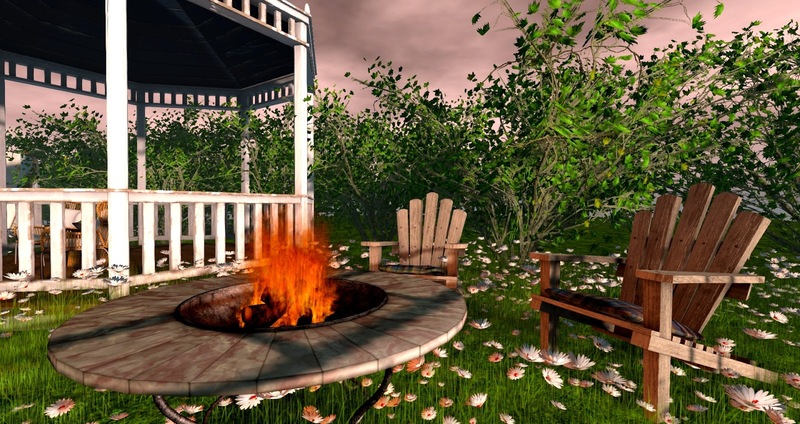 In SL it is also raining where I am but no sign of snow. 2. I updated and got the new SL viewer and have no idea how to add all my windlights. If anyone knows please let me know.